I am still up in Anchorage, Alaska at the Providence Alaska Medical Center, as our family has banded together in support of our brother, Doug, who has been battling MRSA Pneumonia and ADEM...basically an auto immune response to the MRSA, resulting in brain inflammation which has created multiple brain seizures. It is now these seizures, and the need for this level of deep sedation to keep them at bay, that are now our single biggest worries, out of everything he has been through in the past month. He has been placed in a deep coma since shortly after he was admitted to the ER on June 8th and been through weeks of massive does of propofol and now two other sedatives besides previous antibiotics, antivirals, anti seizure, anti-yeast, and other drugs. After many, many days of daily (and often multiple times a day) visits to his critical care room where we suit up in masks, gowns, gloves, plus repeated hand washings before and after all entrances and exits...I can honestly say that I am feeling continually hopeful, and never more so than today as we are all evaluating our time here and the changing of the guard of who goes home to their own families, who continues on, here and who will return to help out as needed down the road. While Doug still has the serious brain inflammation and the need for large doses of sedation drugs for his induced coma, those drugs have been reduced some and replaced by less long term problematic ones. It is am almost daily trial by error and learning by experience situation for his doctors, as many of these experiences and results have been very different in scope with unexpected problems and results. But as of today, my hope is ever renewed and I am feeling really good about this day and his place (and ours) in it. First, the MRSA is totally gone. Not only in his lungs, but from his entire body that often lies dormant in us when we don't even know we have it after hospitalizations etc. Gone. Things like yeast infections of the skin (bed sores etc) have healed faster than one nurse told us she had ever seen happen. And while he has been resistant to regular doses of almost all of the medicines and required massive, massive doses of them, we were told that his body not only accepted them ....but when other patients would have needed a crash cart, he did not. That has been amazing. Those are the wonderful (and to me) miraculous things. He is still in acute critical care, but for the first time he was assessed for 'recovery' placement down the road. ....a very hopeful sign. This is not to be taken as meaning he is ok in a medical sense...just that this is huge to me, to our family, and to his nurses... when we were all so on the edge of not knowing if he would even, or ever, get to this point. I am so filled with gratitude for being able to be here.....with him and my extended family.... and for all of the comments, emails, and prayers that you have shared with me and with all who read here. They have meant the world to me. This is a small step for him, but to me this is huge and I feeling deeply grateful that we have gotten him and his family to this point. We do not know, medically, what tomorrow may bring. But my strength and faith in where we are at, for even just now, is feeling fortified and deeply grateful for this time, and this place. Thank you for your comments, your private emails, your sharing, your prayers and the community of caring. 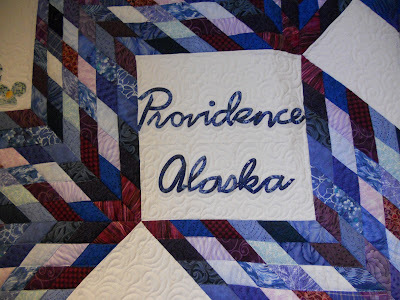 This quilt was one of the very first synchronistic and meaningful discoveries as I entered Providence Alaska Medical Center on the first day, of my first visit to see my brother, Doug, in the Adult Critical Care Center. Amidst the energies of so many facing pain, loss, fear, and challenge...it reminds me that there is peace, beauty and layers of soft healing held together by the stitches of love and caring. Very good news. Still, I'm sending positive thoughts and prayers for Doug and your entire family. I'd like to hear soon he is feeling 100% better. Well, I'm happy for these positive news and I wait for more positive news. Praise The Lord...We serve an awesome God..Continuing to Pray for ALL! 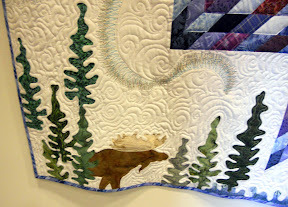 The quilt is beautiful..I am sure it was sewn with love to be an encouragement to everyone. Such detail.Thank you for sharing your heart. Continuing to keep your brother, sister-in-law, you and the rest of your family in my prayers. Prayers, fervent ones, continue without ceasing. Still praying for you and all your family. I have no excuse to not let you know that you and your family have been in my thoughts and prayers. I've been here, reading and wondering, but I've been here as silent support. The prayers and well wishes will continue . . . so very glad to hear this latest news!!! I am glad to hear there is good news, and continue to keep your brother and the rest of your family in my thoughts and prayers. That is such good news. God Bless! Stopping by to add my prayers too. I love your positive attitude. I sure hope your brother comes out of it and everything is fine in the end. Sending a big hug, lots of prayers to all of you. Your posts remind me of so many times of my own. Hang in there, it does get better. Thanks for the update. You, your brother and family continue to be in my prayers. God is good. Ah Michele, I am so happy for you and your family that things are so hopeful for your brother. You are in my heart, thoughts and prayers. Dear Michele, your family is in our prayers.